Formed in 1973, this German based band took the sound of Progressive Jazz Rock to a new level. Taking the concept approach to the music, this totally instrumental album is a re-release of their 1976 self-titled album, and it frequents places not too dissimilar to the likes of Bo Hannson, Allan Holdsworth era Soft Machine, Kollective without the flute, Mahavishnu Orchestra, and possibly hints of Frank Zappa at times in his more instrumental stuff. The musicianship is excellent on all parts, the Bass, Drums, Guitar and Keyboards all show a mastery that is required to play such intricate jazz influenced compositions, of which Frob are very competent at doing, and man do they show it throughout the eight tracks on the album. Coming out of the 70’s German Kraut Rock scene, the music is a must for connoisseurs and enthusiasts of intelligently crafted jazz chaos, and as drummer Peter Meuffels explains, “we don’t want to show off, we simply want a play good music. Hence we regard our instruments as pure tools.”The music is indeed good and the quality of the sound is excellent, as one would expect from top quality musicians. It is a driving, energetic, and conceptual music, a one that flows effortlessly through its forty minutes without a mistake to be heard, and it seems that every note and beat is as tight as a knats chuff, as it were. 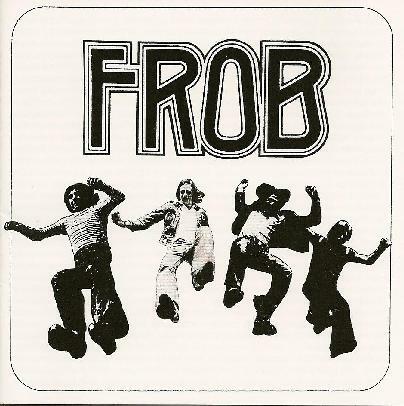 Frob are a definite for those who like Jazz Rock with slight Progressive tones, it is quality stuff throughout.